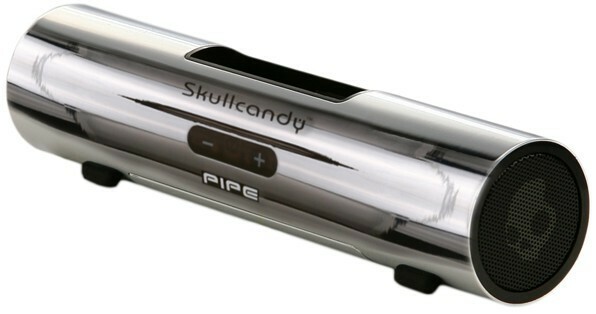 Accessorize your iPod with the PIPE iPod dock from Skullcandy. This dock forms an elegant base for charging and syncing with your computer or for connecting an iPod to your audio system. This system is compatible with most docking iPods and any MP3/CD player with a 3.5mm headphone jack. You can even control your iPod from afar using the included remote. The PIPE plugs into the wall, or can be powered by 4xAAA batteries for ultimate portability. Compatibility: iPod, iPod mini, iPod nano, iPod Color, iPod Video, iPod Video, iPod classic, iPod touch 1st generation, iPod touch 2nd generation, iPod touch 3rd generation (only limited functionality with the remote control), iPhone, iPhone 3G, iPhone 3GS, iPhone 4. Plugs into the wall or runs on 4xAAA batteries.